For many hundreds of years, mutton was the main form of sheep meat eaten in these islands. Yet over the past 40 years, it has virtually disappeared from our shops and menus - and we were in real danger of losing one of our iconic foods, as much part of our culture and heritage as roast beef. Happily, the current revival of interest in mutton is putting it back in the spotlight, celebrating the versatility as well as the long tradition of this fabulous-tasting meat. For many hundreds of years, mutton was the main form of sheep meat eaten in the United Kingdom. Yet over the past 40 years it has virtually disappeared from our shops and menus - and we were in real danger of losing one of our iconic foods, as much part of our culture and heritage as roast beef. Happily, the current revival of interest in quality mutton is putting it back in the spotlight, celebrating the versatility as well as the long tradition of this fabulous-tasting meat. And cooking it couldn't be easier than with a modern slow-cooker. Mutton production has been entwined with the British landscape, our history, our wealth and our wellbeing since prehistoric times. The story of sheep and mutton is very much part of the story of the United Kingdom, and indeed of our Empire. Mutton fed our people through the upheavals of the Industrial Revolution, its fat lit our homes, it was served at the last lunch on the Titanic in 1912, and was a birthday meal on Captain Scott’s last expedition. Our uplands today are only enjoyed by walkers because of the sheep that have grazed them for hundreds of years. Mutton may even have had a part to play in saving us from invasion by the forces of Napoleon, as a dish of mutton was a favourite of the Duke of Wellington. It is difficult today to appreciate just how ubiquitous mutton once was. As the authoritative Mrs Beeton exclaimed in 1861 “Mutton is undoubtedly the meat most generally used in families.” With the spread of sheep industries of the New World, so the habit of eating mutton spread across Australia, New Zealand, South Africa and the USA, with three of those industries being the result of a gift by the King of Spain. 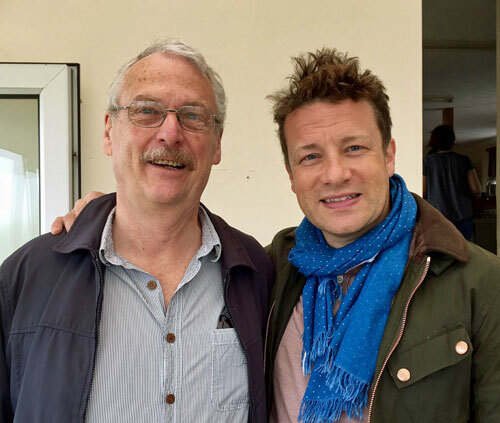 Watch Jamie Oliver Friday 22nd December, 8pm on Channel 4 on mutton, with Jimmy Docherty and author Bob Kennard Available on All 4 Catch-up at www.jamie-and-jimmys-friday-night-feast (series 5, episode 5) until 21st January 2018. Mutton, was the UK's most popular meat for centuries. This website includes extracts from the book by Bob Kennard, entitled 'Much Ado About Mutton', published in September 2014 by Merlin Unwin Books. This is the first comprehensive book about the fascinating story of mutton. It includes the history, social and cultural impact, the farming, and a number of authentic mutton recipes. It also has a list of UK suppliers, and details of mutton breeds, and asks if mutton is the new Super-meat, using recent research on the composition of mutton from Australia. It also discusses the environmental impact of mutton. Signed, first editions can be ordered here. Unsigned copies are available from all good booksellers. A US Coast-to-Coast books signing and talking tour by Bob and Carolyn Kennard took place in late 2015. Read the blog here, and above is a trailer of the blog. Come and stay in the Welsh Borders sheep country, on author's farm. "Mutton is one of Britain's glories - crazily neglected. This is the book to bring that neglect to an end. As Bob Kennard shows so enthusiastically, it's win-win: mutton has a luscious taste, it's rich with the essential fats we need to eat and in eating it we give new life to farms and farmers under threat. BobKennard will make you a believer." "What a splendid new definitive guide to mutton"
"Reader, I confess: I did choose this book for its title alone. Nonetheless, I am proud and pleased to number it among my collection now, and commend both it and my selected recipe to you. Reminiscent of a particular favourite of mine, Welsh Cawl, it's for a good, old-fashioned, proper Mutton Broth." 'Much Ado About Mutton' shortlisted for the Gourmand World Cookbook Awards 2015. 'Much Ado About Mutton' author, Bob Kennard was featured in BBC Radio 4's Food Programme 'Mouthwatering Mutton' on 5th October 2015. Available to listen to now from the BBC website.